Mother's Day is quickly approaching and finding a personal gift for your mom or grandmother can sometimes be a bit of a challenge. For an easy gift idea, you can make a DIY flower bouquet with her favorite flowers that you bought from the local florist or hand-picked outdoors beautifully presented in a printed wrap that you can assemble as to say thank you to your mom for all she does for you. From a traditional best mom floral wrap to a feminine brushstroke design in pink to a modern black and white brushstroke pattern, one of these 3 free downloadable bouquet wraps should be perfect for your mom. Download the floral wrap templates, either the best mom ever, black brushstroke or pink brushstroke design pdf and print the design onto a letter-sized (8.5" x 11") sheet of cardstock. The template black and white designs can be printed on white or colored paper, but the pink brushstroke design looks best when printed on white cardstock. Thicker sheets of paper such as cardstock work better as it is more durable, so it will keep its shape better when held. Roll the printed sheet of cardstock into a cone shape, by taking one corner on the longer side of the paper and bringing it to the center of the paper. Take the other corner on the same side of paper, and bring it over the first corner in the center and continue rolling the sheet of paper to form a cone shape. When done correctly the bottom point of the cone should be tightly closed so that none of the floral stems will stick through, and there should be a wide opening at the top to hold flowers. Once you have the sheet of paper rolled into a cone, use a long piece of double-sided tape to hold the cone shape together. To hide the tape place the strip of double sided tape between rolled layers of paper so that the tape is not viewable when looking at the exterior of the cone. If you do not have double sided tape, a roll of clear tape can be used instead, to hold the cone together on the back side of the paper cone. After your cone is complete is now time to add the flowers. If possible, try to purchase your mother's favorite flower but if you are not sure what her favorite flower is, roses, peonies, tulips, daisies, ranunculus, or hydrangeas are always a good choice. Place the flowers next to the cone and cut the stems using scissors or floral shears so that the flowers will sit only just above the top of the paper cone. When cutting the base of the flowers it is better to cut a little bit off at a time and test the length of the flowers by placing them in the cone to ensure you do not cut the flowers too short. 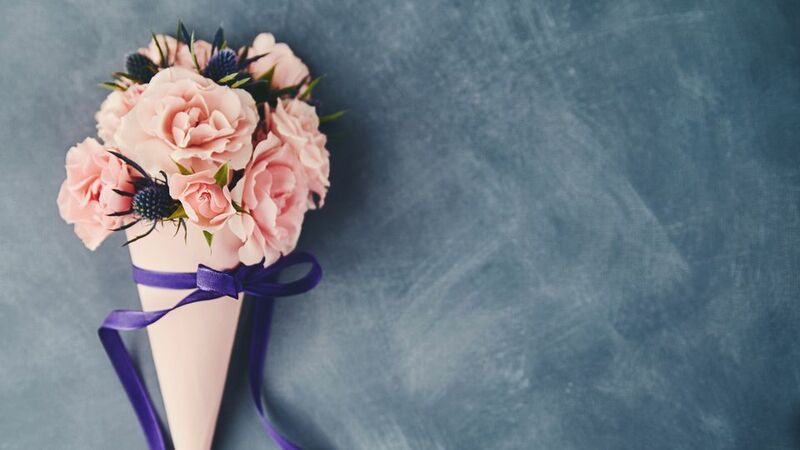 After cutting the stems to the desired length arrange the flowers into a bouquet and wrap floral tape or an elastic band around the base of the stems to hold the flowers together as you have arranged them. 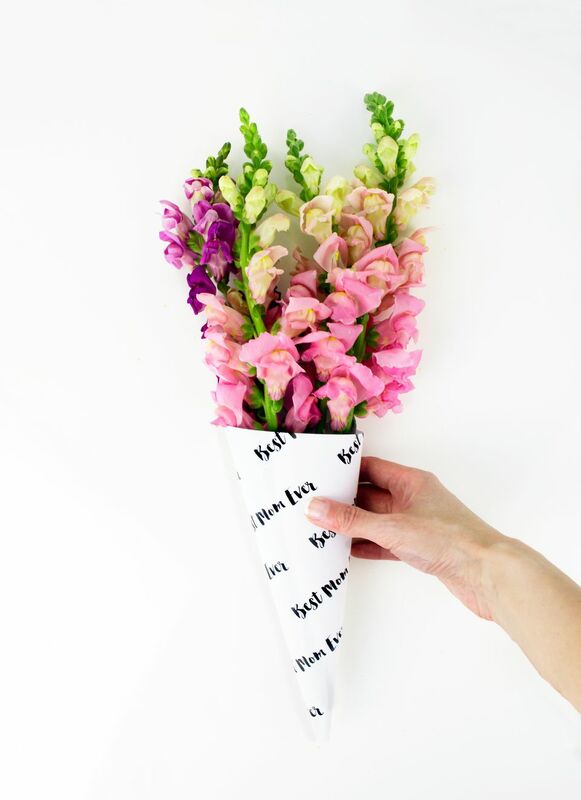 The cut flowers can now be stuck into your handmade cone and are ready to be given to your mom for Mother's Day. So that your flowers don't wilt, make sure to keep the flowers in water until just before you will see your mom and then insert them into the paper cone.